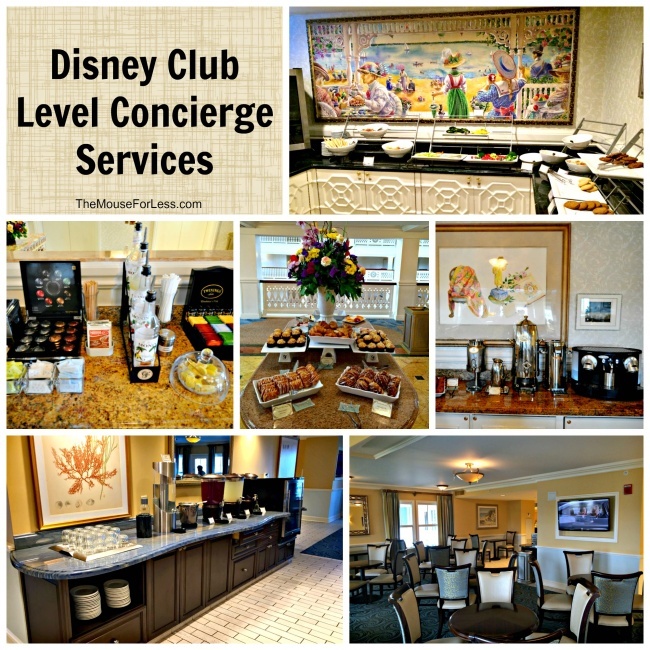 Disney Club Level Concierge services at any hotel offer additional services and access to a knowledgeable and attentive staff. Concierge services at Disney resorts are no exception. Rooms with access to concierge services come at a cost, but it is a luxury with benefits. Concierge level rooms are offered at all the Disney Deluxe resorts. Disney typically refers to these rooms as “club level” rooms to avoid confusion since there is a lobby concierge desk at each Disney resort. Coronado Springs also offers a business class that has some similarities to club level as well. Guests who will be staying in Disney Club Level Concierge rooms have access to the concierge staff to assist with planning before their arrival. The concierge Itinerary Planning Office can help to secure dinner show tickets, arrange dining, and will assist with recreation reservations. They can also help with any other pre-arrival arrangements you may want to make. Be sure to mention if you are celebrating a special event—the concierge staff can be full of suggestions and surprises. The staff is also available once guests arrive and can sometimes help obtain even difficult Advanced Dining Reservations on short notice. Guests complete a Personal Itinerary Planner form after booking and return it to the Itinerary Planning Office to assist in making appropriate reservations. Disney Club Level Concierge rooms usually offer additional amenities including robes to use during your stay, additional toiletries, turn down services, USA Today newspaper, and more. A refrigerator or coffee maker with coffee and tea assortment are available in each room. Concierge guests are also offered a separate check-in area or procedure-usually at or near the lounge. One of the largest benefits of staying in a concierge or club level room is secured key card access to the resort’s concierge lounge. The lounge will have a variety of food and drink offerings throughout the day. The offerings and times vary according to the resort, but a brief overview is provided below. Most of the lounges are also a very comfortable spot to relax and include tables with chairs, comfortable couches and chairs, and a large screen TV with DVD. If you are interested in booking a stay at one of the Walt Disney World Resorts with club level service, we suggest you contact The Magic For Less Travel, an Authorized Disney Vacation Planner. Their expert planners can help you plan a vacation that includes a resort stay that meets your needs. The Magic for Less Travel also offers exclusive promotions and complimentary services that will enhance your vacation. The general Disney Club Level Concierge schedule below is followed by most of the concierge lounges at Disney. Times are approximates and vary according to resort. Of course this schedule is always subject to change and offerings can vary. Check with the concierge staff for a more details and accurate listing. 11:00 a.m. – 4:00 p.m. Snacks and/or tea with sodas, iced tea, lemonade, coffee, tea, and snack foods like crackers, pretzels, cookies and nuts. 5:00 – 7:00p.m. Hot appetizers, children’s corner, cruidites, cheese tray, beverages, wine and beer. 8:00 – 10:00 p.m. Desserts and cordials with a selection of cordials and desserts from the resort’s restaurants. Three additional FastPass+ experiences per person, per day. The ability to book these extra FastPass+ experiences 90 days in advance. The ability to book these FastPass+ experiences in multiple parks. Disney Club Level Concierge guests interested in this option should contact Disney Signature Services directly at (407) WDW-7777 or (407) 939-7777. There are 55 club level rooms and 19 suites available. The Animal Kingdom’s Kilimanjaro Club Lounge is located on the 6th floor of the resort. Concierge Rooms are located throughout the resort and there are some Deluxe Villa rooms that have access to concierge services as well. One of the big draws for concierge guests at the Animal Kingdom Lodge is the access to the Sunrise and Sunset (Wanyama) safaris. There is an extra charge for both of these tours, but they are both very unique and exciting experiences. The Sunrise Safari offers guests a unique and private safari and breakfast at Disney’s Animal Kingdom Lodge. While the Wanyama safari gives guests a unique tour of the savannas at the Animal Kingdom Lodge as well as dinner at Jiko, a signature restaurant at the Lodge. Beach Club offers 73 club level rooms and 22 club level suites. The Yacht Club offers 67 club level rooms and 22 club level suites The Beach Club’s Stone Harbor Club and the Yacht Club’s Regatta Club Lounges are located on the 5th floor of the resorts. Also worthwhile to note the rooms at the Beach Club do not all have balconies, if this is something that is important to you remember to request this when making your reservation. The Boardwalk Inn offers 37 club level rooms and 20 club level suites. Known as the Innkeepers Club, the concierge rooms and lounge are located on the fourth floor of the Boardwalk Inn. Concierge rooms are also located on the fourth floor. The lounge has a nice balcony, and is a very comfortable and inviting room. There have been many star sightings in this lounge – probably due to the really nice suites located on the concierge floors. The Contemporary Resort offers a total of 53 club level rooms and 27 club level suites. The Contemporary has two concierge lounges with two different names – the Atrium Club Concierge and the Tower Club Concierge. The Atrium Club concierge lounge and rooms are located on the 12th floor of the resort. Rooms have a view of Bay Lake or the Magic Kingdom. The lounge on the 12th floor also has three balconies that have a view of the Magic Kingdom and the fireworks. The Tower Club concierge is located on the 14th floor and rooms can have a view of Bay Lake or the Magic Kingdom. Both lounges serve the same foods and have the same service and the 12th and the 14th floor of the resorts are only accessible to guests staying on that floor. Food & beverage offerings throughout the day. The business lounge is not staffed at Coronado Springs. The concierge lounge features continental breakfast, midday snacks and evening wine (additional fee) and cheese. Coconino Cove is open daily from 7:00 a.m. – 10 a.m. and 5 p.m. – 10 p.m. The Polynesian Village offers 102 club level rooms and six club level suites. Concierge rooms are located in the Hawaii longhouse and suites are located in the Tonga longhouse. There are two types of room ‘views’ in the Hawaii building water view and garden view. If you splurge and get a water view room at the Polynesian Village, you will have a wonderful view of the castle. The lounge is also located in the Hawaii building. It is a wonderful-two floor area with walls of windows so you can enjoy the wonderful view looking over the lake toward the Castle. The lounge is an excellent spot to view the MK fireworks, especially with the dessert and drinks that are typically available at that time.There is a second Club Level lounge in the Tonga building that is available from 7:00 a.m. – 3:00 p.m. only. Since it closes earlier, evening food items are not available. The Wilderness Lodge offers 67 club level rooms and eleven club level suites. Concierge rooms at the Wilderness Lodge have access to the Old Faithful Club concierge lounge. Disney Club Level Conciergerooms and the lounge are located on the 7th floor of the Wilderness Lodge. The lounge area overlooks the lobby-one of the nicest lobbies in all of Walt Disney World. If you enter the lobby and look up to the top of the resort, you may catch a view of the lounge area. Rooms can have a view of the courtyard, woods, or other areas of the resort. People often ask if Disney Club Level Concierge is ‘worth’ the extra cost. Concierge services are designed as an extra level of service. They were never designed as a money saving alternative. Although the food and snacks are nice, with the exception of the continental breakfast, they were not designed to replace an entire meal. The biggest draw is the convenience and the extra services. It is hard to put a price on convenience, and even more difficult to put a price on the extra care, services, and attention provided by the concierge cast members. Guests often stay at the concierge level when looking for extra relaxation, or extra pampering, or just that extra something special. It is also a great place to celebrate a special occasion like a birthday or anniversary.